I have been blessed with the spirit, love, and looks of the wonderful persona of Santa Claus. With that has come my mission and responsibility to share this character with all people. I truly believe I have been chosen, like many of my brother Santas, to make the world a better place by sharing the spirit of Christmas all year long. My time with you hopefully will prove that I am the best entertainer you can have to bring the Spirit of Christmas into your life. 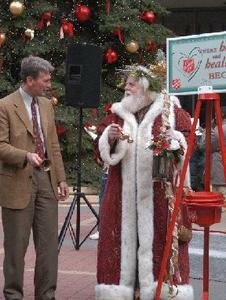 Since 1993, I have performed as one of the premiere natural real bearded Santa Claus in the nation. I have performed in Minneapolis and St Paul at too many varied events to mention. From a company event with over a thousand adults in a hotel ball room to a deployed military family gathering in a helicopter hanger; from ringing bells 20 hours for Salvation Army to being in a Christmas production on a major theater stage; from being the surprise guest at a wedding to delivering the ring at a wedding proposal; from taking the first Santa picture of an hour old baby to taking the first Santa picture with a elderly veteran. Even with hundreds of events, parties, visits, galas, parades, interviews, fund raisers, photo shoots, and media work, I have continued to volunteer time to the community and especially those with economic, physical, and mental challenges. My time with the children's hospitals, churches, out reach programs, and the Salvation Army are my all time best moments. I bring the spirit and excitement of this jolly soul to your guests in either a very traditional way or an up to date variation of what I call Uptown Santa. With a full wardrobe of costumes, I can bring many variations of the character to your festivity. I have the old world green Father Christmas long fur accented robes, festive walking staff, and elegant tunics or the classic Coca Cola style Santa suit that is typical. Plus there are casual wear, long robes, or a jazzy red zoot suit available as options. My specialty is to make Santa Claus as believable as possible. I do this with my looks, my deep knowledge of Christmas and its customs, and by the use of North Pole props. 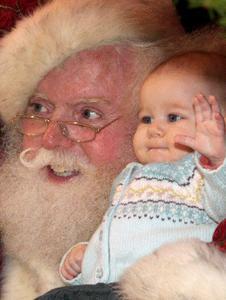 My real white beard, rosy cheeks, twinkling eyes, and belly that shakes like jelly are all natural. My Christmas knowledge is based on lots of internet research, formal symposium training sessions, and books from around the world. Our props include every thing from real reindeer sleigh rides, bells that I use on the baby reindeer, the magic whistle used to call reindeer, the mystical potion to make reindeer fly, my Naughty and Nice list that has details about every child, to my special smart phone app that has a Naughty and Nice scanner ! But my best prop isn't a thing, its my partner Jenny as Mrs Claus. Jenny and I have a natural ability to bring to life this North Pole couple in such a realistic way, it's scary ! 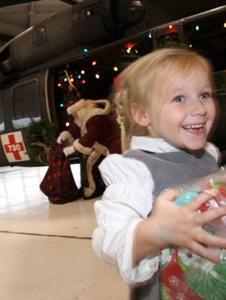 Our banter and anecdotes that revolve around our life with elves and toy making make the visits even more believable. Plus we take the cutest pictures with your family, friends, or company members since Jenny has all the necessary matching costumes for our events so that we truly look the part of Mr and Mrs Claus. Both Jenny and I are fully insured and have yearly background checks performed by a trusted screening company. I have been involved with the business of Santa Claus and have voluntarily given my successful marketing, entertaining, and business abilities to others in the Santa Claus community. Since 1993 I have trained and been trained by some of the best Santas in the business. I have been recognized by the Santa Claus community and have served in various local, regional and national organizations of the Santa Claus brotherhood. We in the business strive to establish a common level of competence to all Santa Claus entertainers through the use of training, standards, and commitment to a strong sense of pride for the character. I have served on numerous committees for those purposes and am proud to have been picked to be on the official Santa Claus Oath committee, authorized to give the Santa Claus Oath below. 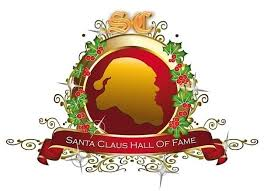 In 2017, because of the following criteria, I was inducted into the International Santa Claus Hall of Fame. I humbly accepted the highest recognition and honor in my industry with the challenge to others of following my lead and make the path of the younger men coming behind us easier by sharing their successes and failures. This event you are hosting is one of the most important events of your year. As you can see, you aren't picking a guy that just picked up a red Santa suit from the local party costume store. You are picking a professional entertainer that cares not only about the picture that goes up on the mantel, but wants for you to have had a totally believable, fun, entertaining visit with the jolly old soul himself, Santa Claus. My goal is that, not only are your children going to tell their friends of the unbelievable time they had during the visit, but for you to remember, talk, proudly show pictures to all of your friends and family of this exciting event. and good will to all the people that I encounter in my journeys and travels. I acknowledge that some of the requests I will hear will be difficult and sad. I know in these difficulties there lies an opportunity to bring a spirit of warmth, understanding and compassion. to life in the true and sincere tradition of the Santa Claus Legend. Sadly my Mrs Claus partner, Cheryl Claus aka Cheryl Saxrud, passed away in April 2018. The hole in my heart will heal and the memories of our 8 years of creating happiness for our clients and loved ones hopefully will linger forever. Her giggles and loving ways are missed every day. I loved this woman and we had a magical relationship that brought us into the lives of thousands of people. We were business partners as well, making props, clothing, and accessories for the Santa and Mrs Claus community. Cheryl was a beautiful woman inside and out and changed the lives of many other Mrs Claus who saw her as an inspiration. Her non traditional costuming was classic yet stylish and was copied by many others in the community with her help. She mentored rookie Mrs Claus' on all aspects of the persona from makeup, costuming, and accessories to helping Santa entertain a small home party or hundreds at a major event. Her demeanor was a kind, loving, and giving yet she had a great business sense and was so talented for crafting unique one of a kind accessories for both Mrs and Santa Claus'. Together Cheryl and I have done over 775 visits that included everything from single parents with challenged children, church events and bazaars, and fundraisers for charities and health donations. We did hundreds of multi-family parties, company, home, large venue events, corporate parties with over a thousand attending, and sports celebratory actions. Cheryl was always such a complementary addition to any event with her beautiful smile, costumes, and persona. Her quick wit and giggling anecdotes would bring children to her and they loved hearing the stories she told. I have tried to keep Cheryl's legacy alive by continuing to share her ideals, her compassion, and leadership in the Mrs Claus social groups. Cheryl's influence is palpable in the industry and memories of her love for the Mrs Claus character will last a long time. Late in 2018, I was blessed to find a new Mrs Claus partner, Jenny Lynn Claus aka Jenny Beck. She has big shoes to fill but with the good Lord's help and the memories of Cheryl fresh in our minds, I believe she will be quite successful.